Lanzarote is an island like no other. The appeal of this beautiful Canary Island, not far from the coast of West Africa, is its unique and spectacular volcanic landscape. So distinct and unusual is the landscape on Lanzarote that the Timanfaya National Park, with its moonscape terrain, was declared a UNESCO Biosphere Reserve in 1993. Naturally, with a landscape this stunning and distinct, Lanzarote is a fantastic place to head to for walkers, cyclists, hikers, horse riders, photographers, artists, and just about anyone else who wants to get outside and discover the island’s unique beauty. 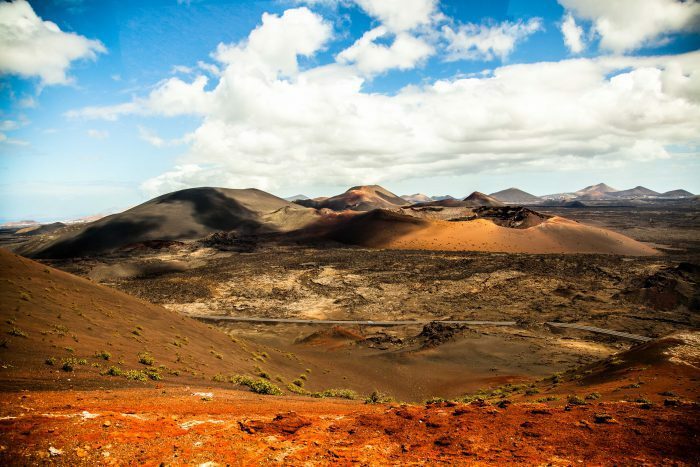 Lanzarote’s distinct scenery can be seen at its optimum in the Timanfaya National Park. The cones of approximately 360 volcanoes rise dramatically from the park’s iconic granular black sand. The most prominent feature of this vast and atmospheric landscape is the Islote de Hilario volcano. This unmistakable volcanic peak was a point of inspiration for Cesar Manrique, Lanzarote’s famous artist and architect, who used the Islote de Hilario as the setting for his work. Recognising the incredible views that stretch from this high point, Manrique designed at restaurant at the zenith, known as El Diablo, where diners can enjoy magnificent panoramic views of the Timanfaya National Park. The restaurant even takes advantage of the park’s thermal anomalies, which are the highest recorded on the Canary Islands, in the guise of a natural oven, which prepares meals using the natural warmth of the earth. Due to the fragility of the rocks in the Timanfaya National Park, it’s impossible to walk around unaccompanied. Instead, scheduled buses take visitors around the park, past the main features and highlights. Another thoroughly unique volcanic attraction on Lanzarote can be found at the Jameos del Agua. Hailed as a place on earth where “nature and mankind decided to come together,” the Jameos del Agua was once little more than the debris of a volcanic tube with lava flowing from Volcan de la Corona, to the north of the island. Recognising its distinct aesthetics, Cesar Manrique transformed part of the cave into an art, culture and tourism centre. For some, the Jameos del Agua, is the cornerstone of the artist’s creative work. Fortunately, largely due to Manrique who rallied against mass building on the island, Lanzarote has been spared the worse of overdevelopment and remains a beautiful island to discover and explore some of the most unique and finest landscapes our planet is blessed with.